I don’t have much time to write this post, so I’m hoping the pictures will speak for themselves. 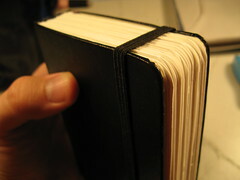 Today I took a Moleskine small daily planner and reloaded it with 90 lb. 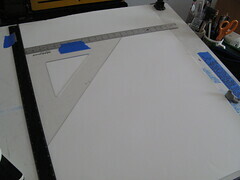 Fabriano Artistico hot press watercolor paper (according to the instructions posted by Martha at Trumpetvine Travels). This is something I’ve been meaning to do for months, but with Sketchcrawl 15 tomorrow and only two pages left in my current Moleskine sketchbook, today was the day. Some of the watercolored sketches I’ve posted in the past couple weeks have been on loose pieces of Fabriano Artistico already cut and folded with the intention of binding, but I never got around to it. Well, at least now I’m sure I like this paper. It’s versatile. It takes well to pencil, ink, and watercolor. 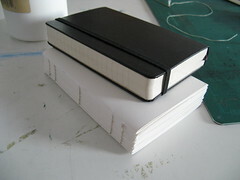 Everything I need in a sketchbook but in the Moleskine format. Anyway, here are the pictures! Sorry there are so many. I’ve sized them down to make them a little more manageable. Beautiful. 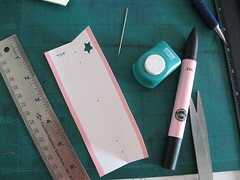 Thanks for sharing your pictures and pointing back to Martha’s tutorial. 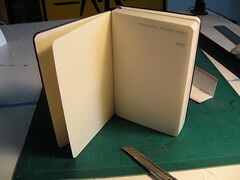 Yes, would certainly like to have a Moleskine with good paper in it… Now I just have to work up the patience to do the mod. Thanks, Maile! It’s my first. It’s totally functional, but I’ll probably do better next time. First thing, I won’t leave my watercolor paper rolled up for two weeks. I’m trying all kinds of things to get the curve out. 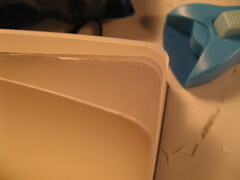 Second, I could’ve folded the pages a little crisper. 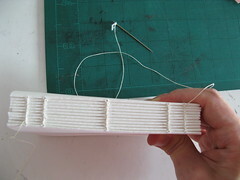 This would cut down on the thickness of the bookblock. Thirdly, the signatures are sewn pretty well, but they could’ve been sewn to one-another a lot more tightly. All-in-all, though, it’s a successful first run at it. I’d encourage you not to be shy and just go for it. Martha’s instructions are very good. How’d it work out for the Sketchcrawl? Do we get to see? Yup! Turned out just fine. I’ll post some results on Monday. Thanks for checking back! Your book looks just great. Thank you for taking the photos and sharing them; it is really captivating for me to see others doing that project that I know so well. 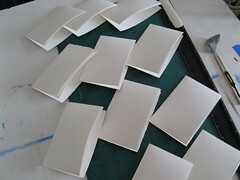 Isn’t it fun to make books? Thank you, Martha! I’m glad you enjoyed looking at the photos. Thanks again for sharing your knowledge and inspiring me to do this project. It is fun! 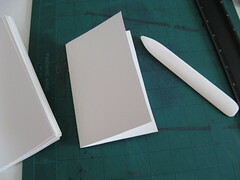 Even though I took two semesters of “Books” when I was in college, I took LOTS of notes on bookbinding, but I didn’t do very much of it and/or never quite got the hang of it. 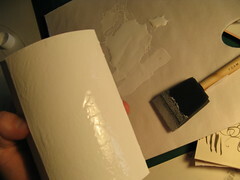 I mostly focused on experimental books and letterpress printing broadsides and postcards. 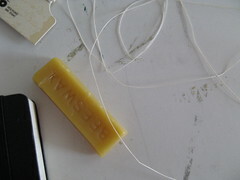 SO… it is really nice to get back into it and take it to the next step. 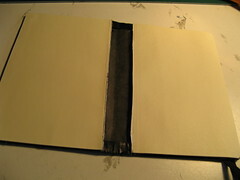 I too have followed Martha’s directions for reloading a sketchbook with great results. I haven’t tried the moleskine daily planner yet but I like your idea of using the precut watercolor pages and then binding them. I am traveling to Europe for a month in October and might just take the paper and bind when I get home….I also loved all your photos! 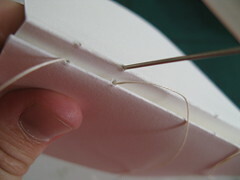 I think I will post a photo of the last book I bound as well. mARTa — Well, you’re giving me a little too much credit. 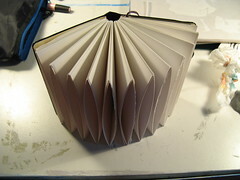 I never said anything about binding the used loose pages into the book, so that was YOUR idea! haha! You get the credit! HOWEVER, I did actually have the thought to do that very thing at one time, but when it came time to bind the book, I forgot about it entirely. Thanks for the reminder. Now I wish I had. Oh well, maybe they’ll fit in the back pocket. Nice work! I wish I had the patience for this kind of project. Thanks, Steve. I’m sure you could do this. I did it in about half a day or afternoon to early evening. What took the longest was acquiring all the supplies beforehand. 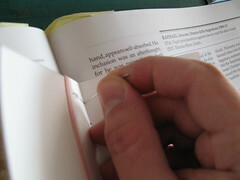 Hi there, could the curve in the page be because the paper grain runs across the book, rather than parallel with the spine? If so, try that next time - it will help a great deal. Thanks, livebird. Good point. I’m pretty sure the grain is running parallel with the spine. Martha’s recommendations take this into account to help with folding. I definitely think the curve is from leaving the paper rolled up for too long. 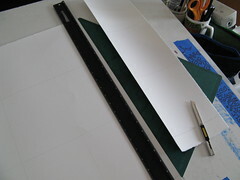 Plus, I accidentally used 22×30″ 300gsm paper instead of 22×30″ 200gsm — see my post here: http://blog.artandstory.com/2007/09/07/notes-on-materials-moleskine-mod — and I think this made the curve more stubborn. 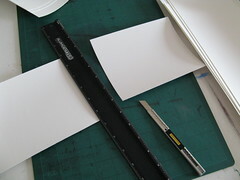 A lighter weight paper would have been more flexible. 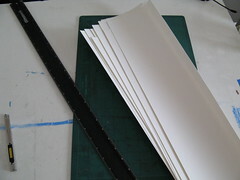 This looks great - it really inspires an interest in book and paper crafts. Thanks Stephen! If I can do that, then it’s all the more worthwhile. 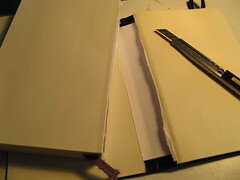 They seem to use the same paper and for the price if you are using a moleskin planner it may be worth the few extra bucks for the saved time. I decided on just making an insert for my leather sketch cover using Martha’s tutorial. 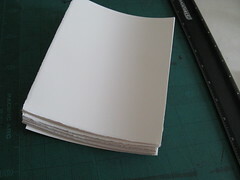 http://www.dickblick.com/zz100/61a/ is pretty cheap takes 2 sheets so total cost is pretty low. btw thx for posting all your findings so far ive built a custom sketch book and now use a kuretake brush pen constantly.